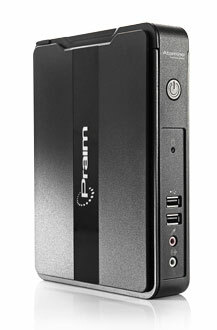 The new Intel Atom 1.86 Ghz Dual Core platform, provides the highest performance of Praim’s product range. • Access to a wide range of applications: from centralized infrastructure such as Citrix XenApp, XenDesktop, Microsoft RDS and VMware View, to the latest cloud based resources. • Extremely low power consumption: less than 10 W.
• High reliability and immediate centralized management through Praim ThinMan management console. • Native dual DVI monitor support. • 5 external USB ports, 1 in secured slot, built-in speaker. • Built-in WiFi factory option. • Small and compact can be installed on the back of the LCD monitor.